Soaking Wet for Water Aid. What a day Sing for Water North 2016 turned out to be. 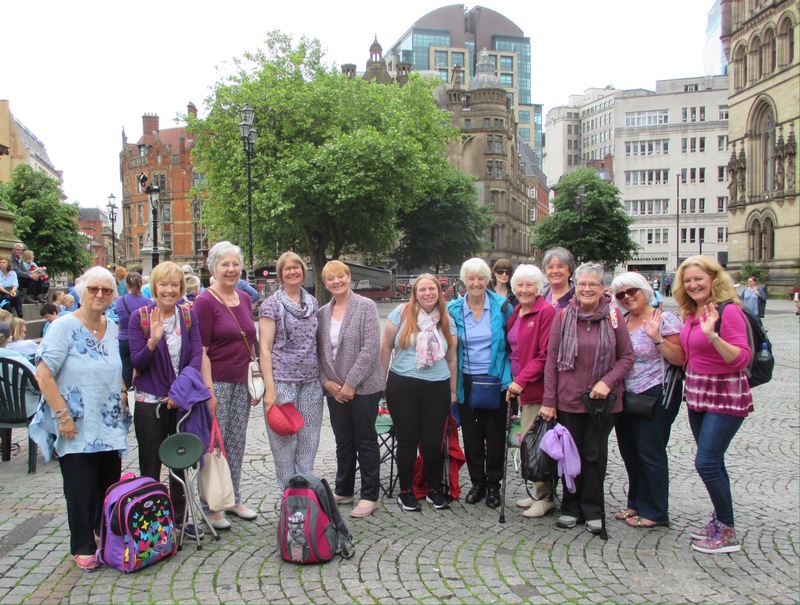 A group of 14 women from Singing for the Soul choir set off from Burnley, on the X43 bus, to join many other choirs to ‘sing for water’, in Albert Square, Manchester. We left Burnley in glorious sunshine, with some of us feeling confident that the sun would continue to shine. However many people turned up, very sensibly, in fleeces and trainers with waterproof jackets whilst the optimists turned up in lightweight macs, short sleeves and even sandals. 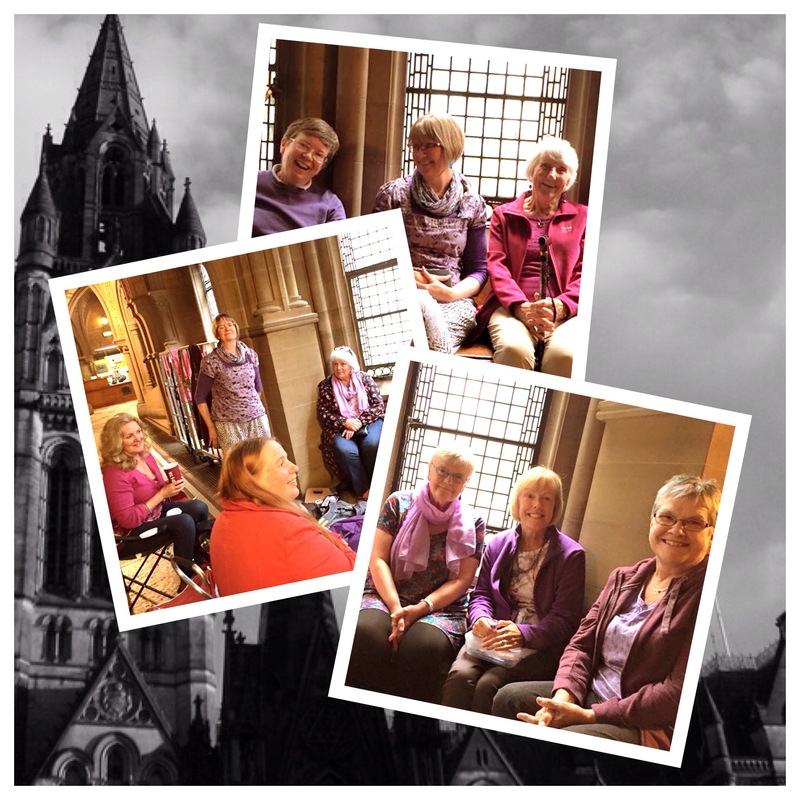 We arrived in Manchester to find people were already gathering and, before we knew it, all 300 or so of us sorted ourselves out into our colours, blue for sopranos, purple for altos etc. Olwyn and Jackie lead us from the front and it went so well. It went so well that after ‘Singing in the Rain’ the heavens opened. At first it was fun and it seemed appropriate that it should happen but after a few minutes, glasses were steaming up, rain running down the necks of the optimists and the rest unable to hear properly because their hoods were up, so we had to dash for shelter. We were undaunted though as Manchester Town Hall came to the rescue and allowed us the privilege of singing inside. People were moved to tears to be a part of such a huge choir, singing in such an amazing place with such fabulous acoustics. Thanks to Diane Halstead for the short film. Janet Large also made two recordings of the full songs. At lunchtime it was still raining and we became squatters in the town hall, all sitting in window alcoves, to eat together and laugh, of course. Sarah Nutter was busy with her camera and captured some of the squatters. Then we were ready to start. We trooped back to Albert Square to find the rain had eased off. Despite the showers we were magnificent. We got through the repertoire almost perfectly .. Then we did them all again. All recordings can be found here. The main thing of course was that we were singing for Wateraid. We raised £900 by collecting with buckets on the day and £7,800 in total so far this year. It’s not too late to give. Just giving. Why not join us for next year. Fun and good singing guaranteed. Thank you to everyone involved but especially to Janet Swan who made sure we were all ready for the day, by the giving up of her own time for extra rehearsals and for creating such a great choir, giving everyone a chance to find their voice and be a part of Sing for Water North 2016. Sing for Water North 2016 .. Singing in the Rain.